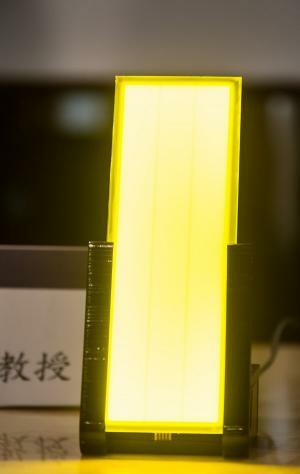 Taiwan's PMOLED maker WiseChip Semiconductors licensed National Tsing-Hua University's blue-light free OLED lighting technology, with an aim to mass produce panels. Supported by the Taiwanese government, Wisechip aims to start mass producing those 1900K OLEDs within two years. Today we have some more information on this interesting project. National Tsing Hua updates that they have now developed (together with Wisechip) a 2nd-gen lighting panel that features an efficiency of 70 lm/W and is 5x15 cm in size. The University has been awarded two OLED lighting awards (a Taiwanese golden-award and the IDA Lighting Design Award). Wisechip has been testing these devices in their current PMOLED lines, and are working towards scaling up production. According to the current plan, mass production will begin in Q4 2017. Tsing-Hua's researchers say that people should consider new candle-light style lighting sources for reading, residence and street light. They also urge governments and legislators to enact new rules that will force light-based products to show the light spectrum emitted by the product. The researchers quote an article published last year that suggests that white LED is linked to breast cancer. White light may case irreversible eye damage, it suppresses melatonin secretion at night and is linked to all sorts of health problems.